I use Chrome for all my web browsing tasks. While using Chrome, I have installed and used various extensions which let me alter the webpage I am on. Mostly these extensions are webpage-specific; this means that they are designed for one particular website in mind. For example there are Chrome extensions out there which modify our outlook of Facebook. Similarly there is an extension which changes the way Battle forums look. 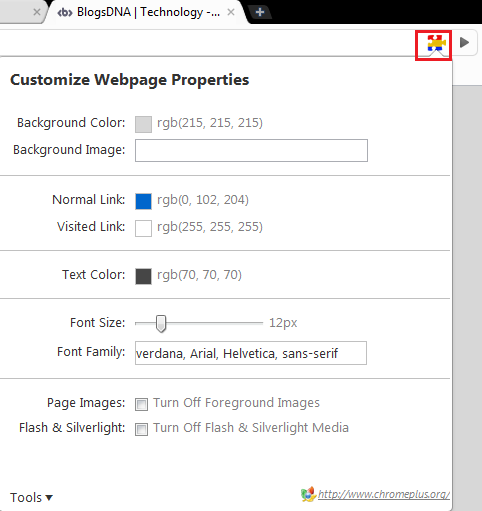 Today I am going to cover an extension which unlike other webpage-customizing tools, gives us total control over the color scheme of a webpage. The best part is that this extension is not webpage-specific and can be used on any website. It is called Webpage Decorator. People with eyesight problems might find the whole-white backgrounds of certain websites rather irritating to their eyes. Such people or anybody who is generally not satisfied with a website’s color scheme can set their own preferred colors for the site via Webpage Decorator. The image above shows BlogsDna’s default layout. You can notice a jigsaw-piece type icon in the address bar (in front of the URL). This icon is of Webpage Decorator. Clicking on it will open a dropdown window which lets us set our own color scheme. I changed the background image, font size, font color, and removed any pictures on the site. Webpage Decorator will now save these settings for BlogsDna and show me this page as it is every time I visit it. These customizations can be reverted by selecting the appropriate option from the dropdown window. Webpage Decorator can be used for internet users with eyesight problems, people dissatisfied by a webpage’s color scheme, or simply for some color-fun. Whatever you use it for, this Chrome extension executes its functions beautifully and I give it two thumbs up. Wow, great find Umar…. I am really loving it. There are many blogs with black background which i don’t like at all.